Water is the base that reacts with the acid HA, A− is the conjugate base of the acid HA, and the hydronium ion is the conjugate acid of water. A strong acid yields 100% (or very nearly so) of and A− when the acid ionizes in water; [link] lists several strong acids. A weak acid gives small amounts of and A−. Some of the common strong acids and bases are listed here. File ended while scanning use of \text@. Because the ratio includes the initial concentration, the percent ionization for a solution of a given weak acid varies depending on the original concentration of the acid, and actually decreases with increasing acid concentration. Calculate the percent ionization of a 0.125-M solution of nitrous acid (a weak acid), with a pH of 2.09. Remember, the logarithm 2.09 indicates a hydronium ion concentration with only two significant figures. Calculate the percent ionization of a 0.10-M solution of acetic acid with a pH of 2.89. Water is the acid that reacts with the base, HB+ is the conjugate acid of the base B, and the hydroxide ion is the conjugate base of water. A strong base yields 100% (or very nearly so) of OH− and HB+ when it reacts with water; [link] lists several strong bases. A weak base yields a small proportion of hydroxide ions. Soluble ionic hydroxides such as NaOH are considered strong bases because they dissociate completely when dissolved in water. View the simulation of strong and weak acids and bases at the molecular level. A table of ionization constants of weak bases appears in Appendix I (with a partial list in [link]). As with acids, percent ionization can be measured for basic solutions, but will vary depending on the base ionization constant and the initial concentration of the solution. The extent to which an acid, HA, donates protons to water molecules depends on the strength of the conjugate base, A−, of the acid. If A− is a strong base, any protons that are donated to water molecules are recaptured by A−. Thus there is relatively little A− and in solution, and the acid, HA, is weak. If A− is a weak base, water binds the protons more strongly, and the solution contains primarily A− and H3O+—the acid is strong. Strong acids form very weak conjugate bases, and weak acids form stronger conjugate bases ([link]). This diagram shows the relative strengths of conjugate acid-base pairs, as indicated by their ionization constants in aqueous solution. 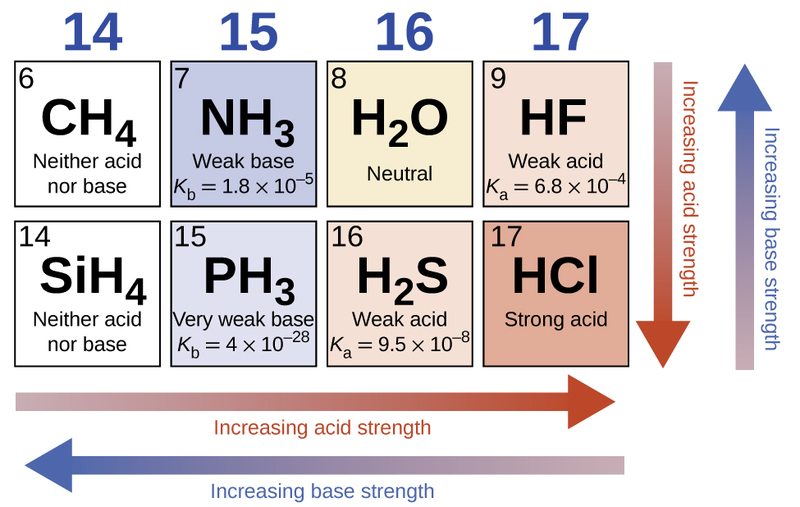 [link] lists a series of acids and bases in order of the decreasing strengths of the acids and the corresponding increasing strengths of the bases. The acid and base in a given row are conjugate to each other. The chart shows the relative strengths of conjugate acid-base pairs. 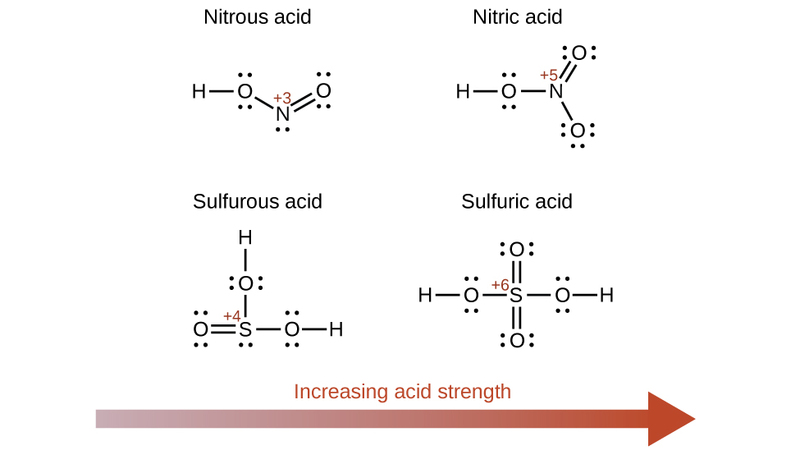 The first six acids in [link] are the most common strong acids. These acids are completely dissociated in aqueous solution. The conjugate bases of these acids are weaker bases than water. When one of these acids dissolves in water, their protons are completely transferred to water, the stronger base. Those acids that lie between the hydronium ion and water in [link] form conjugate bases that can compete with water for possession of a proton. Both hydronium ions and nonionized acid molecules are present in equilibrium in a solution of one of these acids. Compounds that are weaker acids than water (those found below water in the column of acids) in [link] exhibit no observable acidic behavior when dissolved in water. Their conjugate bases are stronger than the hydroxide ion, and if any conjugate base were formed, it would react with water to re-form the acid. 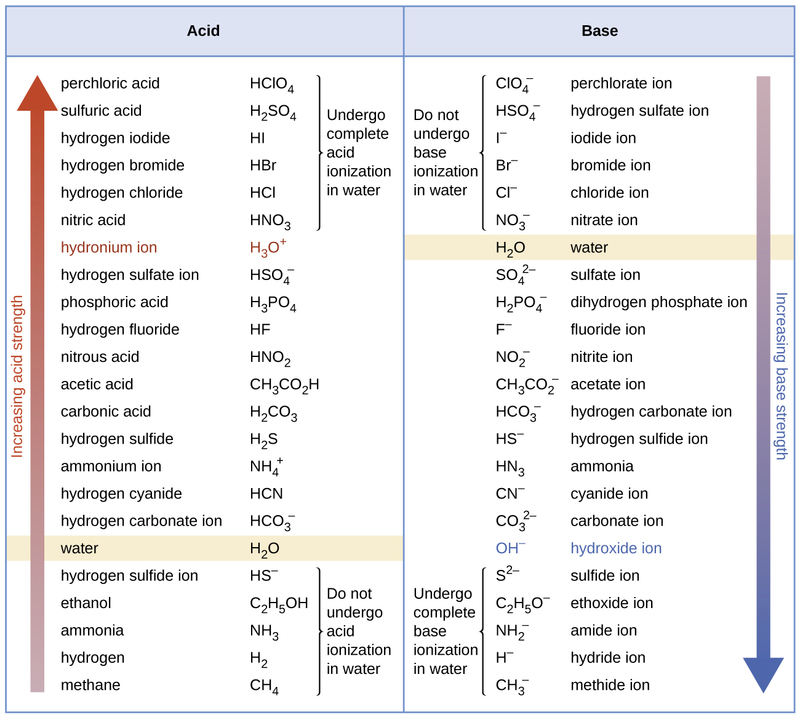 The extent to which a base forms hydroxide ion in aqueous solution depends on the strength of the base relative to that of the hydroxide ion, as shown in the last column in [link]. A strong base, such as one of those lying below hydroxide ion, accepts protons from water to yield 100% of the conjugate acid and hydroxide ion. Those bases lying between water and hydroxide ion accept protons from water, but a mixture of the hydroxide ion and the base results. Bases that are weaker than water (those that lie above water in the column of bases) show no observable basic behavior in aqueous solution. Use the Kb for the nitrite ion, to calculate the Ka for its conjugate acid. This answer can be verified by finding the Ka for HNO2 in Appendix H.
is the slightly stronger acid (Ka for = 5.6 10−10). Many acids and bases are weak; that is, they do not ionize fully in aqueous solution. A solution of a weak acid in water is a mixture of the nonionized acid, hydronium ion, and the conjugate base of the acid, with the nonionized acid present in the greatest concentration. Thus, a weak acid increases the hydronium ion concentration in an aqueous solution (but not as much as the same amount of a strong acid). giving an equilibrium mixture with most of the acid present in the nonionized (molecular) form. This equilibrium, like other equilibria, is dynamic; acetic acid molecules donate hydrogen ions to water molecules and form hydronium ions and acetate ions at the same rate that hydronium ions donate hydrogen ions to acetate ions to reform acetic acid molecules and water molecules. 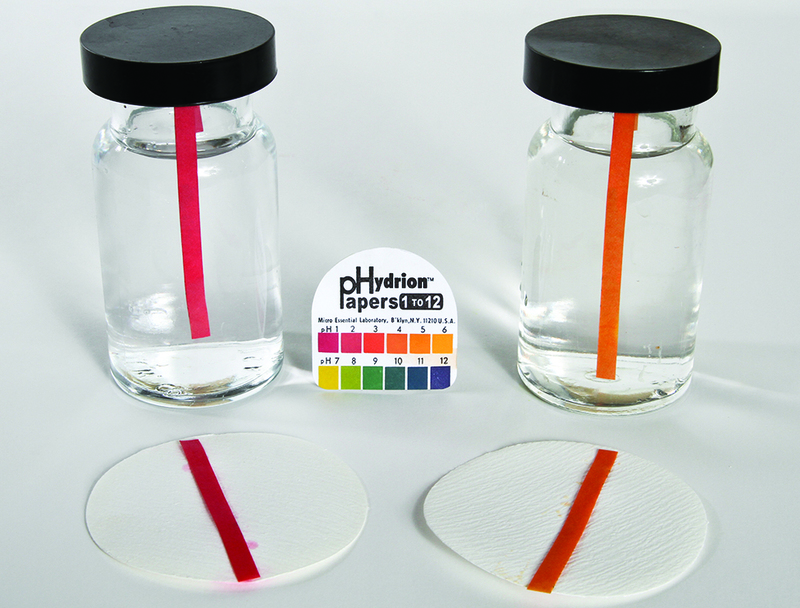 We can tell by measuring the pH of an aqueous solution of known concentration that only a fraction of the weak acid is ionized at any moment ([link]). The remaining weak acid is present in the nonionized form. [link] gives the ionization constants for several weak acids; additional ionization constants can be found in Appendix H.
At equilibrium, a solution of a weak base in water is a mixture of the nonionized base, the conjugate acid of the weak base, and hydroxide ion with the nonionized base present in the greatest concentration. Thus, a weak base increases the hydroxide ion concentration in an aqueous solution (but not as much as the same amount of a strong base). giving an equilibrium mixture with most of the base present as the nonionized amine. This equilibrium is analogous to that described for weak acids. The ionization constants of several weak bases are given in [link] and in Appendix I.
Acetic acid is the principal ingredient in vinegar ([link]); that’s why it tastes sour. At equilibrium, a solution contains [CH3CO2H] = 0.0787 M and What is the value of Ka for acetic acid? Caffeine, C8H10N4O2 is a weak base. What is the value of Kb for caffeine if a solution at equilibrium has [C8H10N4O2] = 0.050 M, = 5.0 10−3M, and [OH−] = 2.5 10−3M? The pH of a 0.0516-M solution of nitrous acid, HNO2, is 2.34. What is its Ka? The change in concentration of is the difference between the equilibrium concentration of H3O+, which we determined from the pH, and the initial concentration, The initial concentration of is its concentration in pure water, which is so much less than the final concentration that we approximate it as zero (~0). The change in concentration of is equal to the change in concentration of For each 1 mol of that forms, 1 mol of forms. The equilibrium concentration of HNO2 is equal to its initial concentration plus the change in its concentration. The pH of a solution of household ammonia, a 0.950-M solution of NH3, is 11.612. What is Kb for NH3. 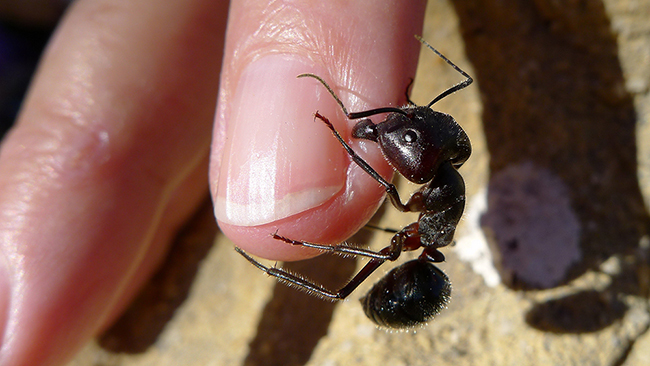 Formic acid, HCO2H, is the irritant that causes the body’s reaction to ant stings ([link]). What is the concentration of hydronium ion and the pH in a 0.534-M solution of formic acid? The concentration of water does not appear in the expression for the equilibrium constant, so we do not need to consider its change in concentration when setting up the ICE table. x is less than 5% of the initial concentration; the assumption is valid. Only a small fraction of a weak acid ionizes in aqueous solution. What is the percent ionization of acetic acid in a 0.100-M solution of acetic acid, CH3CO2H? The following example shows that the concentration of products produced by the ionization of a weak base can be determined by the same series of steps used with a weak acid. This change is less than 5% of the initial concentration (0.25), so the assumption is justified. Check the work. A check of our arithmetic shows that Kb = 6.3 10−5. Check Your Learning(a) Show that the calculation in Step 2 of this example gives an x of 4.0 10−3 and the calculation in Step 3 shows Kb = 6.3 10−5. Some weak acids and weak bases ionize to such an extent that the simplifying assumption that x is small relative to the initial concentration of the acid or base is inappropriate. As we solve for the equilibrium concentrations in such cases, we will see that we cannot neglect the change in the initial concentration of the acid or base, and we must solve the equilibrium equations by using the quadratic equation. Solve for x and the concentrations. As we begin solving for x, we will find this is more complicated than in previous examples. As we discuss these complications we should not lose track of the fact that it is still the purpose of this step to determine the value of x. The value of x is not less than 5% of 0.50, so the assumption is not valid. We need the quadratic formula to find x. In this problem, a = 1, b = 1.2 10−3, and c = −6.0 10−3. (a) Show that the quadratic formula gives x = 7.2 10−2. Strong acids, such as HCl, HBr, and HI, all exhibit the same strength in water. The water molecule is such a strong base compared to the conjugate bases Cl−, Br−, and I− that ionization of these strong acids is essentially complete in aqueous solutions. In solvents less basic than water, we find HCl, HBr, and HI differ markedly in their tendency to give up a proton to the solvent. For example, when dissolved in ethanol (a weaker base than water), the extent of ionization increases in the order HCl < HBr < HI, and so HI is demonstrated to be the strongest of these acids. The inability to discern differences in strength among strong acids dissolved in water is known as the leveling effect of water. Thus, O2− and appear to have the same base strength in water; they both give a 100% yield of hydroxide ion. In the absence of any leveling effect, the acid strength of binary compounds of hydrogen with nonmetals (A) increases as the H-A bond strength decreases down a group in the periodic table. For group 17, the order of increasing acidity is HF < HCl < HBr < HI. Likewise, for group 16, the order of increasing acid strength is H2O < H2S < H2Se < H2Te. Across a row in the periodic table, the acid strength of binary hydrogen compounds increases with increasing electronegativity of the nonmetal atom because the polarity of the H-A bond increases. Thus, the order of increasing acidity (for removal of one proton) across the second row is CH4 < NH3 < H2O < HF; across the third row, it is SiH4 < PH3 < H2S < HCl (see [link]). As you move from left to right and down the periodic table, the acid strength increases. As you move from right to left and up, the base strength increases. If the central atom, E, has a low electronegativity, its attraction for electrons is low. Little tendency exists for the central atom to form a strong covalent bond with the oxygen atom, and bond a between the element and oxygen is more readily broken than bond b between oxygen and hydrogen. Hence bond a is ionic, hydroxide ions are released to the solution, and the material behaves as a base—this is the case with Ca(OH)2 and KOH. Lower electronegativity is characteristic of the more metallic elements; hence, the metallic elements form ionic hydroxides that are by definition basic compounds. If, on the other hand, the atom E has a relatively high electronegativity, it strongly attracts the electrons it shares with the oxygen atom, making bond a relatively strongly covalent. The oxygen-hydrogen bond, bond b, is thereby weakened because electrons are displaced toward E. Bond b is polar and readily releases hydrogen ions to the solution, so the material behaves as an acid. High electronegativities are characteristic of the more nonmetallic elements. Thus, nonmetallic elements form covalent compounds containing acidic −OH groups that are called oxyacids. Increasing the oxidation number of the central atom E also increases the acidity of an oxyacid because this increases the attraction of E for the electrons it shares with oxygen and thereby weakens the O-H bond. Sulfuric acid, H2SO4, or O2S(OH)2 (with a sulfur oxidation number of +6), is more acidic than sulfurous acid, H2SO3, or OS(OH)2 (with a sulfur oxidation number of +4). Likewise nitric acid, HNO3, or O2NOH (N oxidation number = +5), is more acidic than nitrous acid, HNO2, or ONOH (N oxidation number = +3). In each of these pairs, the oxidation number of the central atom is larger for the stronger acid ([link]). As the oxidation number of the central atom E increases, the acidity also increases. In this case, protons are transferred from hydronium ions in solution to Al(H2O)3(OH)3, and the compound functions as a base. The strengths of Brønsted-Lowry acids and bases in aqueous solutions can be determined by their acid or base ionization constants. Stronger acids form weaker conjugate bases, and weaker acids form stronger conjugate bases. Thus strong acids are completely ionized in aqueous solution because their conjugate bases are weaker bases than water. Weak acids are only partially ionized because their conjugate bases are strong enough to compete successfully with water for possession of protons. Strong bases react with water to quantitatively form hydroxide ions. Weak bases give only small amounts of hydroxide ion. The strengths of the binary acids increase from left to right across a period of the periodic table (CH4 < NH3 < H2O < HF), and they increase down a group (HF < HCl < HBr < HI). The strengths of oxyacids that contain the same central element increase as the oxidation number of the element increases (H2SO3 < H2SO4). The strengths of oxyacids also increase as the electronegativity of the central element increases [H2SeO4 < H2SO4]. The salt ionizes in solution, but the anion slightly reacts with water to form the weak acid. This reaction also forms OH−, which causes the solution to be basic. Use this list of important industrial compounds (and [link]) to answer the following questions regarding: CaO, Ca(OH)2, CH3CO2H, CO2, HCl, H2CO3, HF, HNO2, HNO3, H3PO4, H2SO4, NH3, NaOH, Na2CO3. (a) Identify the strong Brønsted-Lowry acids and strong Brønsted-Lowry bases. (b) List those compounds in (a) that can behave as Brønsted-Lowry acids with strengths lying between those of H3O+ and H2O. (c) List those compounds in (a) that can behave as Brønsted-Lowry bases with strengths lying between those of H2O and OH−. The odor of vinegar is due to the presence of acetic acid, CH3CO2H, a weak acid. List, in order of descending concentration, all of the ionic and molecular species present in a 1-M aqueous solution of this acid. Household ammonia is a solution of the weak base NH3 in water. List, in order of descending concentration, all of the ionic and molecular species present in a 1-M aqueous solution of this base. Explain why the ionization constant, Ka, for H2SO4 is larger than the ionization constant for H2SO3. The oxidation state of the sulfur in H2SO4 is greater than the oxidation state of the sulfur in H2SO3. Explain why the ionization constant, Ka, for HI is larger than the ionization constant for HF. Gastric juice, the digestive fluid produced in the stomach, contains hydrochloric acid, HCl. Milk of Magnesia, a suspension of solid Mg(OH)2 in an aqueous medium, is sometimes used to neutralize excess stomach acid. Write a complete balanced equation for the neutralization reaction, and identify the conjugate acid-base pairs. What is the ionization constant at 25 °C for the weak acid the conjugate acid of the weak base CH3NH2, Kb = 4.4 10−4. What is the ionization constant at 25 °C for the weak acid the conjugate acid of the weak base (CH3)2NH, Kb = 5.9 10−4? Which base, CH3NH2 or (CH3)2NH, is the stronger base? Which conjugate acid, or , is the stronger acid? Which is the stronger acid, or HBrO? Predict which acid in each of the following pairs is the stronger and explain your reasoning for each. Predict which compound in each of the following pairs of compounds is more acidic and explain your reasoning for each. (a) higher electronegativity of the central ion. 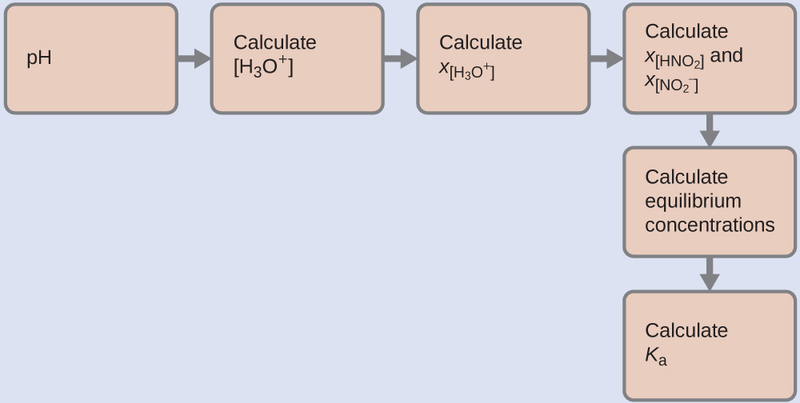 (b) H2O; NH3 is a base and water is neutral, or decide on the basis of Ka values. (c) HI; PH3 is weaker than HCl; HCl is weaker than HI. Thus, PH3 is weaker than HI. (d) PH3; in binary compounds of hydrogen with nonmetals, the acidity increases for the element lower in a group. (e) HBr; in a period, the acidity increases from left to right; in a group, it increases from top to bottom. Br is to the left and below S, so HBr is the stronger acid. Rank the compounds in each of the following groups in order of increasing acidity or basicity, as indicated, and explain the order you assign. (c) basicity: Mg(OH)2, Si(OH)4, ClO3(OH) (Hint: Formula could also be written as HClO4). (a) NaHSeO3 < NaHSO3 < NaHSO4; in polyoxy acids, the more electronegative central element—S, in this case—forms the stronger acid. The larger number of oxygen atoms on the central atom (giving it a higher oxidation state) also creates a greater release of hydrogen atoms, resulting in a stronger acid. As a salt, the acidity increases in the same manner. (b) the basicity of the anions in a series of acids will be the opposite of the acidity in their oxyacids. The acidity increases as the electronegativity of the central atom increases. Cl is more electronegative than Br, and I is the least electronegative of the three. (c) HOI < HOBr < HOCl; in a series of the same form of oxyacids, the acidity increases as the electronegativity of the central atom increases. Cl is more electronegative than Br, and I is the least electronegative of the three. (d) HOCl < HOClO < HOClO2 < HOClO3; in a series of oxyacids of the same central element, the acidity increases as the number of oxygen atoms increases (or as the oxidation state of the central atom increases). (e) and are anions of weak bases, so they act as strong bases toward H+. and HS− are anions of weak acids, so they have less basic character. In a periodic group, the more electronegative element has the more basic anion. (f) with a larger number of oxygen atoms (that is, as the oxidation state of the central ion increases), the corresponding acid becomes more acidic and the anion consequently less basic. Both HF and HCN ionize in water to a limited extent. Which of the conjugate bases, F− or CN−, is the stronger base? See [link]. The active ingredient formed by aspirin in the body is salicylic acid, C6H4OH(CO2H). The carboxyl group (−CO2H) acts as a weak acid. The phenol group (an OH group bonded to an aromatic ring) also acts as an acid but a much weaker acid. List, in order of descending concentration, all of the ionic and molecular species present in a 0.001-M aqueous solution of C6H4OH(CO2H). Explain why equilibrium calculations are not necessary to determine ionic concentrations in solutions of certain strong electrolytes such as NaOH and HCl. Under what conditions are equilibrium calculations necessary as part of the determination of the concentrations of all ions of some other strong electrolytes in solution? Strong electrolytes are 100% ionized, and, as long as the component ions are neither weak acids nor weak bases, the ionic species present result from the dissociation of the strong electrolyte. Equilibrium calculations are necessary when one (or more) of the ions is a weak acid or a weak base. Are the concentrations of hydronium ion and hydroxide ion in a solution of an acid or a base in water directly proportional or inversely proportional? Explain your answer. What two common assumptions can simplify calculation of equilibrium concentrations in a solution of a weak acid? 1. Assume that the change in initial concentration of the acid as the equilibrium is established can be neglected, so this concentration can be assumed constant and equal to the initial value of the total acid concentration. 2. Assume we can neglect the contribution of water to the equilibrium concentration of H3O+. What two common assumptions can simplify calculation of equilibrium concentrations in a solution of a weak base? Which of the following will increase the percent of NH3 that is converted to the ammonium ion in water (Hint: Use LeChâtelier’s principle.)? Which of the following will increase the percent of HF that is converted to the fluoride ion in water? (a) Adding HCl will add H3O+ ions, which will then react with the OH− ions, lowering their concentration. The equilibrium will shift to the right, increasing the concentration of HNO2, and decreasing the concentration of ions. (b) Adding HNO2 increases the concentration of HNO2 and shifts the equilibrium to the left, increasing the concentration of ions and decreasing the concentration of OH− ions. (c) Adding NaOH adds OH− ions, which shifts the equilibrium to the left, increasing the concentration of ions and decreasing the concentrations of HNO2. (d) Adding NaCl has no effect on the concentrations of the ions. (e) Adding KNO2 adds ions and shifts the equilibrium to the right, increasing the HNO2 and OH− ion concentrations. What is the effect on the concentration of hydrofluoric acid, hydronium ion, and fluoride ion when the following are added to separate solutions of hydrofluoric acid? Why is the hydronium ion concentration in a solution that is 0.10 M in HCl and 0.10 M in HCOOH determined by the concentration of HCl? This is a case in which the solution contains a mixture of acids of different ionization strengths. In solution, the HCO2H exists primarily as HCO2H molecules because the ionization of the weak acid is suppressed by the strong acid. Therefore, the HCO2H contributes a negligible amount of hydronium ions to the solution. The stronger acid, HCl, is the dominant producer of hydronium ions because it is completely ionized. In such a solution, the stronger acid determines the concentration of hydronium ions, and the ionization of the weaker acid is fixed by the [H3O+] produced by the stronger acid. From the equilibrium concentrations given, calculate Ka for each of the weak acids and Kb for each of the weak bases. Determine Kb for the nitrite ion, In a 0.10-M solution this base is 0.0015% ionized. Determine Ka for hydrogen sulfate ion, In a 0.10-M solution the acid is 29% ionized. For which of the following solutions must we consider the ionization of water when calculating the pH or pOH? Even though both NH3 and C6H5NH2 are weak bases, NH3 is a much stronger acid than C6H5NH2. Which of the following is correct at equilibrium for a solution that is initially 0.10 M in NH3 and 0.10 M in C6H5NH2? (a) is the correct statement. Calculate the equilibrium concentration of the nonionized acids and all ions in a solution that is 0.25 M in HCO2H and 0.10 M in HClO. Calculate the equilibrium concentration of the nonionized acids and all ions in a solution that is 0.134 M in HNO2 and 0.120 M in HBrO. Calculate the equilibrium concentration of the nonionized bases and all ions in a solution that is 0.25 M in CH3NH2 and 0.10 M in C5H5N (Kb = 1.7 10−9). Calculate the equilibrium concentration of the nonionized bases and all ions in a solution that is 0.115 M in NH3 and 0.100 M in C6H5NH2. Using the Ka value of 1.4 10−5, place in the correct location in [link]. Calculate the concentration of all solute species in each of the following solutions of acids or bases. Assume that the ionization of water can be neglected, and show that the change in the initial concentrations can be neglected. Ionization constants can be found in Appendix H and Appendix I.
Propionic acid, C2H5CO2H (Ka = 1.34 10−5), is used in the manufacture of calcium propionate, a food preservative. What is the hydronium ion concentration in a 0.698-M solution of C2H5CO2H? 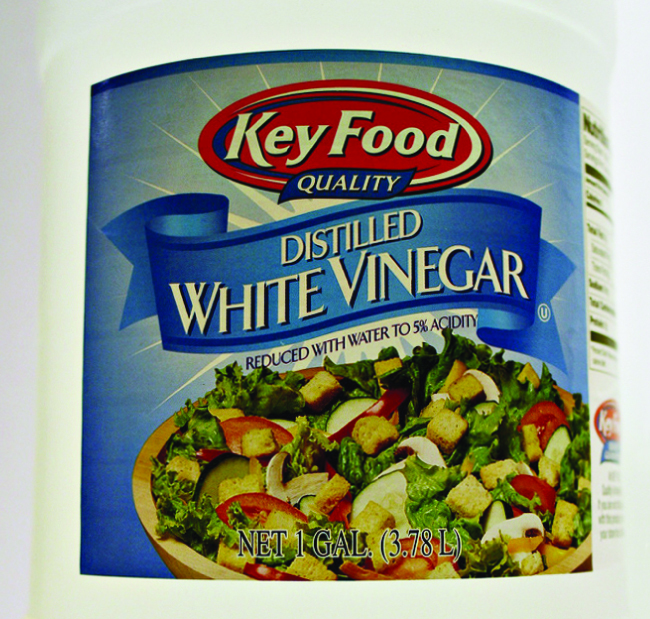 White vinegar is a 5.0% by mass solution of acetic acid in water. If the density of white vinegar is 1.007 g/cm3, what is the pH? The ionization constant of lactic acid, CH3CH(OH)CO2H, an acid found in the blood after strenuous exercise, is 1.36 10−4. If 20.0 g of lactic acid is used to make a solution with a volume of 1.00 L, what is the concentration of hydronium ion in the solution? Nicotine, C10H14N2, is a base that will accept two protons (K1 = 7 10−7, K2 = 1.4 10−11). What is the concentration of each species present in a 0.050-M solution of nicotine? The pH of a 0.20-M solution of HF is 1.92. Determine Ka for HF from these data. The pH of a 0.15-M solution of is 1.43. Determine Ka for from these data. 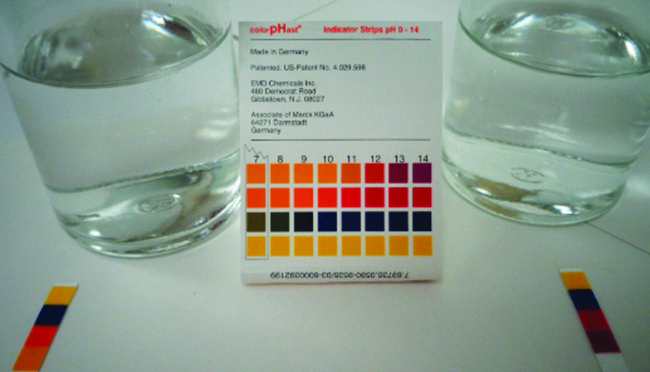 The pH of a solution of household ammonia, a 0.950 M solution of NH3, is 11.612. Determine Kb for NH3 from these data. Relative Strengths of Acids and Bases by OpenStaxCollege is licensed under a Creative Commons Attribution 4.0 International License, except where otherwise noted.